SSR LLC – The Cheapest Pound of Ethylene – Why LYB Should Buy LYB – Or WLK!! 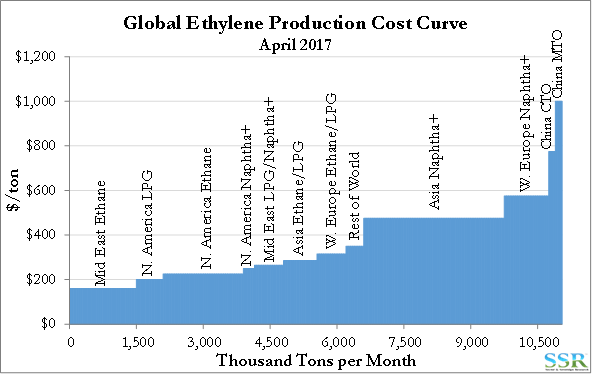 The Cheapest Pound of Ethylene – Why LYB Should Buy LYB – Or WLK!! Lyondell’s decision to increase its dividend and potentially return to share buyback as a core strategy reflects the reality that LYB stock is one of the most cost effective ways of buying US ethylene capacity today. It is cheaper than building a new facility and much cheaper than the price recently agreed between Nova and Williams. Depending on the value that you place on its chlorine and PVC business, WLK is probably the cheapest pound of US ethylene today. It is possible that LYB was in discussions with WLK – or possibly CPChem and that either these discussions did not result in an agreement or that the fall in LYB’s share price has made the buyback more compelling. It is also possible that negotiations continue and that today’s announcement from Lyondell is part of the process – putting the buyback in place as a credible alternative to a deal. Note that LYB has announced that the buyback has been authorized and did not indicate that it would be in the market immediately. In previous research, we identified WLK and CPChem as the only possible targets around which LYB could spin a positive story, which at the same time fit with the scale of transaction discussed in LYB’s analyst day. As shown in Exhibit 1, unless you place an unreasonably low value on WLK’s chlorine chain, WLK looks like a relative bargain on a replacement cost basis. LYB has stated that it is looking for a business which can be improved operationally – while the legacy WLK is well run, there remains significant opportunity with the legacy Axiall assets. Both LYB and WLK are attractive acquisition targets to potential investors in the US looking for ethylene – versus building from scratch. Also in prior research, we have shown that the current ethylene market does not support investment in the US, but bizarrely does support investment in Asia based on naphtha. We would not be surprised to see announcements in Asia and cancellations in the US if the current margin structure lasts. While both SABIC/Exxon and Total/Nova/Borealis have US plans, if current US economics persist through year-end we could see these delayed or cancelled. These are uncertain times in ethylene. Not desperate times, like those suffered by the industry in the early 1980s or early 1990s – Exhibit 2; just uncertain. Almost coincident with the wave of new start-ups in the US we have margins for ethylene well below current reinvestment levels and, if sustained for several years, at levels which would lead to single digit IRRs for the new investments. Many should cover their cost of capital, even at these lower margins, but those over-budget and late may struggle to cover even their cost of debt. Those 2013-2015 investment decisions, which are now reaching construction completion, relied on a US margin umbrella, driven by high crude oil price and low natural gas prices. As expected, US ethylene and derivative pricing has fallen relative to the rest of the world as the US pushes more ethylene into export markets. 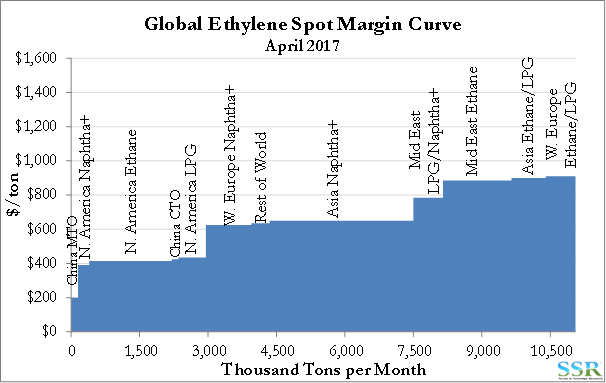 As capacity increases in the US, the marginal ethylene price should continue to reflect the marginal derivative export value – probably polyethylene as ethylene is more concentrated in polyethylene than in other derivatives. Except for the recently announced DOW and LYB possible debottlenecks, are all the cheap expansions behind us? Does an unattractive capex environment drive more M&A – is LYB right to be considering deals? Where is the cheapest pound of ethylene to purchase today? Regardless of the feedstock advantage in the US, margins do not support a new-build today, but they support further low cost additions – the economics of the last five years have likely driven every low-cost expansion possible in the US, and we are assuming that only LYB and DOW have further room to expand at or below 50% of full replacement cost. Given the age of the US capacity we have probably hit constraints on space as much as anything else – partly illustrated by the Total deal – which involves building a new ethylene plant where the scale is dictated by the amount of land available adjacent to Total’s existing unit. It is possible that the other new-builds have expansion potential, like DOW, but DOW is being driven by a need to expand polyethylene capacity to meet growing demand for its specific grades – especially in consumer packaging. It is unclear whether others have the same strategic driver. Today, margins in Asia reflect the shortage in the region and export economics from the US. Naphtha based margins in the US are not lagging ethane materially, because of high co-product costs, but in Asia they support reinvestment because of very high current ethylene prices – the current market would suggest building naphtha based capacity in China rather than ethane based capacity in the US. In Exhibits 3 and 4 we borrow work from Woodmack which shows the dislocation in global profitability relative to costs. In Exhibit 3 we show the global cost curve for April and in Exhibit 4 we show the global margin curve. Some of the highest margins today are in regions with the highest costs! What is shown in Exhibits 3 and 4 is no more of a stable state of affairs than three years ago with crude at $120 and natural gas at $4.00 in the US, but it has been this way for several months and will possibly lead to some Chinese investment. Just as US investment decisions were driven by the “now” of 2012-2014 in Exhibit 1, decisions to invest in Asia will likely be driven by the “now” margin structure today. The cycle of investing at the wrong time and consequently losing money over the longer-term is likely to continue – see recent research. The idea that was suggested that LyondellBasell should build a new ethylene plant in the US with its surplus cash shows no grasp of longer-term trends and the uncertainty associated with such large commitments. So therefore, what should LYB spend its money on – where is the cheapest pound of ethylene today? In Exhibit 1 we showed the summary of ethylene capacity costs in the US today and in addition show an estimate of what we believe it might cost to build a naphtha unit in China. In Exhibits 5 and 6 we show how we get to replacement costs for LYB and WLK. LYB is easier as the company gave a lot of detail in its recent analyst day presentation, plus we are at a point where the world is building new capacity, placing a higher value on LYB assets. For WLK we have adjusted significantly for the chlorine/PVC chain and placed much lower values on those businesses, given the global oversupply and a general lack of interest in adding capacity in the business in the US or Europe. For LYB, in our view the choice is clear – buy back stock or buy WLK. At the same time, both LYB and WLK look like attractive acquisition targets for any company looking to get a foothold in the US and exposure to US shale based feedstocks – WLK is likely a more affordable business for most who might have an interest, but LYB might still have some suitors.